This intensive course covers the legal and claim analysis topics needed for the Pre-Exam. We will give a complete legal overview, using our unique flow-charts. Legal interactive tutorials will be alternated with practicing what has been learned: candidates will experience from the start how this knowledge can be used in an efficient way in order to pass the ​Pre-Exam. Furthermore we will show candidates how to answer the questions in multiple-choice format. In between the 4 blocks candidates are expected to study and to do homework (questions and cases). After having attended this course, candidates will be ready for the exam. ​This course is based on the 12-day Pre-Exam Integrated Training course, the first training course of its kind in Europe which reduces the legal syllabus of the EQE to focus solely on the Pre-Exam. 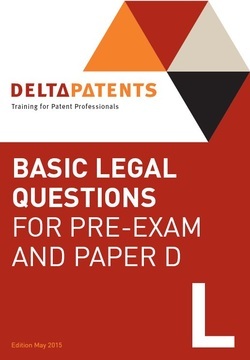 It offers the benefits of DeltaPatents training and materials without attending the sessions in the Netherlands. Instead of face-to-face contact, access to a knowledgeable tutor is in the form of video conference sessions and the possibility to ask questions by phone and e-mail. Using our experiences from many past candidates, the homework is concentrated on the subjects which tend to require the most help. This course will start on the 10th of May and runs until mid February 2020. A 1-day course, explaining how to answer the legal questions of the Pre-Examination. This course can be combined with the 2-day Pre-Exam Claim Analysis course, thereby forming a complete (3-day) Pre-Exam Methodology training. If you register for both the 1-day Pre-Exam Legal Methodology course as well as the 2-day Pre-Exam Claim Analysis course, you will receive a discount of € 100. In this 2-day course, we cover the Claim Analysis part of the Pre-Exam with specific exam methodology. The methodology is practiced using true/false pre-exam format questions and cases and one full pre-exam. This course can be combined with the 1-day Pre-Exam Legal Methodology course, thereby forming a complete (3-day) Pre-Exam Methodology training. For the Pre-Exam we offer a 4-day course in France, in French language. More information can be found here.